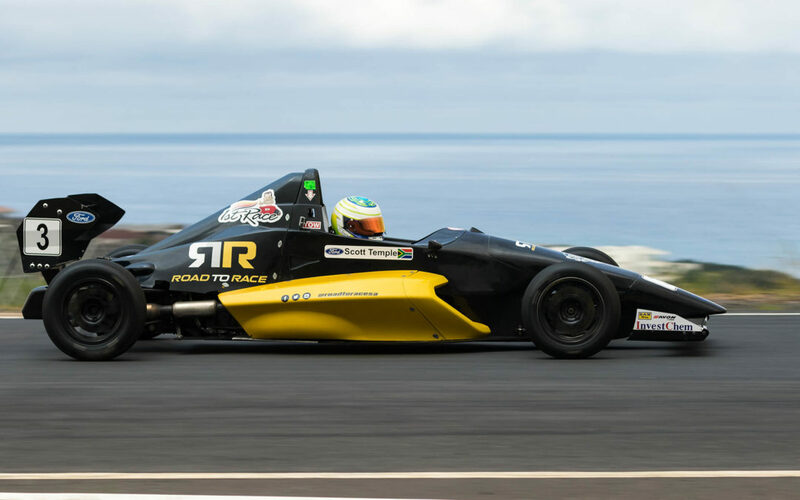 The closest Investchem South African Formula 1600 Championship yet moves into its second round as the series heads for another weekend of great racing at another tight circuit at Zwartkops Saturday. The title race could not be closer after an incredible first round at Dezzi Raceway, which saw two race winners in last year’s championship runner-up, Nicholas van Weely (Magnificent Paints & Hardware van Diemen), before pole man Andrew Rackstraw (RDSA/Investchem Mygale) pulled off his maiden win in race 2. But they only lie third and fourth respectively and a point apart in the championship as 2018 third place man Scott Temple (Road to Race/1st Race Matt Nash Motorsport Mygale) and champion Stuart White (Fantastic Racing Mygale) lead the way, also separated by all of a point at the top of the log. Both of them enjoyed more consistent runs, with a second and a third apiece at the opening race at Port Shepstone KZN’s Dezzi Raceway last month, Scott’s fastest lap of the day earning him that point’s advantage. Those four will not be alone in chasing for that win, not least of all Siyabonga Mankonkwana (Investchem Brian Kruger Racing Mygale), Liam Pienaar (Phoenix Jewellers Mygale) and Tiago Rebelo (TRMS Brian Kruger Mygale) now all keen to emulate Rackstraw with a first win after Andrew beat them to it. Never ignore Class B frontrunner David Jermy (Beauty Factory Fantastic Racing Mygale) and the ever-consistent Andrew Schofield (Investchem Mygale) running interference, while karting lass Ivana Cetinich (Alpha Universal Mygale) is the best paced rookie in the title chase sitting second in Class B.
Alex Gillespie (ERP Trucking Components Matt Nash Motorsport Mygale) is keen to improve on his championship start, as is Gerard Geldenhuys (Abacus Divisions Mygale), while rookies Zac Edwards (SCM Brian Kruger Racing Mygale) and Alex Vos (Ecurie Zoo Magnificent Paints van Diemen) will be looking forward to racing on familiar ground for the first time this weekend. Jermy and Cetinich will have Allen Meyer (Investchem van Diemen) to take care of in Class B reserved for ladies and elder gentlemen, but all of their lots will be made considerably easier in the absence of Mr. Formula 1600, who will be out the country on business. Schofield’s Investchem Mygale will however be racing, its seat filled by the returning Brendan Tracey for the Zwartkops meeting. So if Dezzi was anything to go by, Gauteng race fans should have something special to look forward to as the tightly-fought Investchem South African Formula 1600 Championship heads to the similarly tight, twisty and undulating Zwartkops Raceway this weekend — be sure to be there!